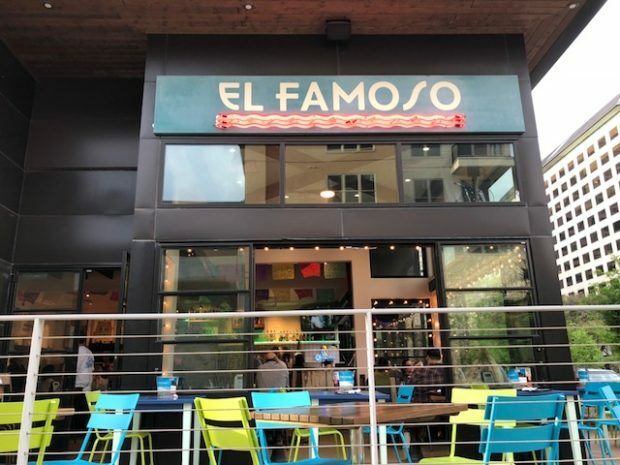 El Famoso recently opened in Irving across Williams Square and the famous mustang statues. The restaurant melds Mexican and Cali-Mex food into something we’re not totally used to in Texas. With a different spin on the menu, El Famoso serves up Mexican comfort food and a great list of drinks. Guests will see a variety of Mexican classics with an American twist, like these appetizers: the spicy Lupita’s Mac and Cheese, Carne Asada Fries and the Chili Monterrey. 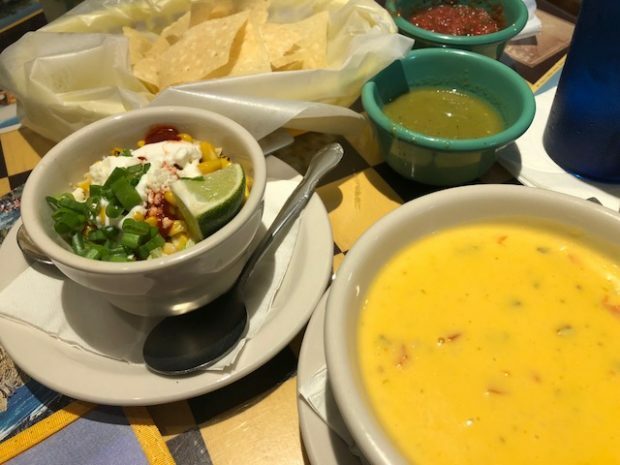 Traditional appetizers, like queso and elotes, are also offered and deliciously amazing due to its creamy and flavorful tastes. 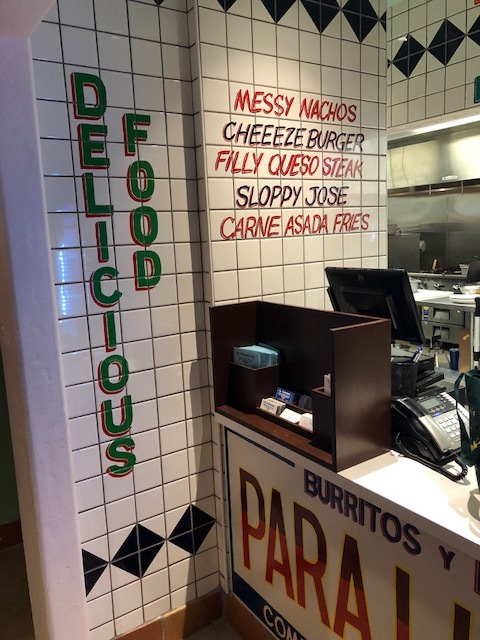 Enchiladas, quesadillas, street tacos and large burritos dominate the rest of the menu, but you’ll also see Cali-Mex items like the Sloppy Jose Sandwich and the Filly QuesoSteak. The 8-inch burritos come packed with meat of you choosing, rice, beans, cheese and queso. Feeling extra hungry? Order the El Monstro – a 14-inche burrito is fully loaded! It’s slathered in queso, ground taco beef, brisket, carnitas, jack cheese, rice, beans, tomatoes and guac. While most menu items range from $10-13, this monster burritos comes to $18. 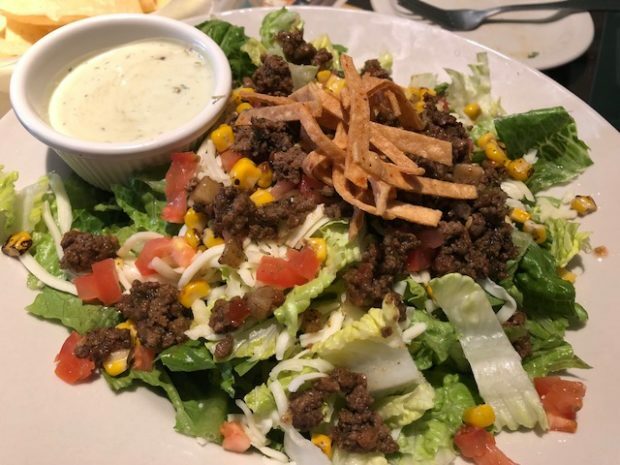 If you’re looking for a lighter dish, you can try the Taco Salad. Large enough to fill up without all the extra carbs. As for sides, choose from pineapple habanero, refried beans, rice, grilled onions, squash and fries. 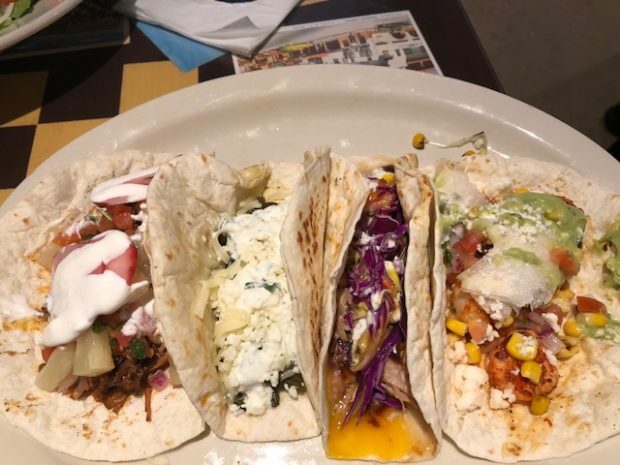 On the weekend breakfast menu, patrons can choose from six different tacos for $3/each and $6 burritos (but not the monster one!). 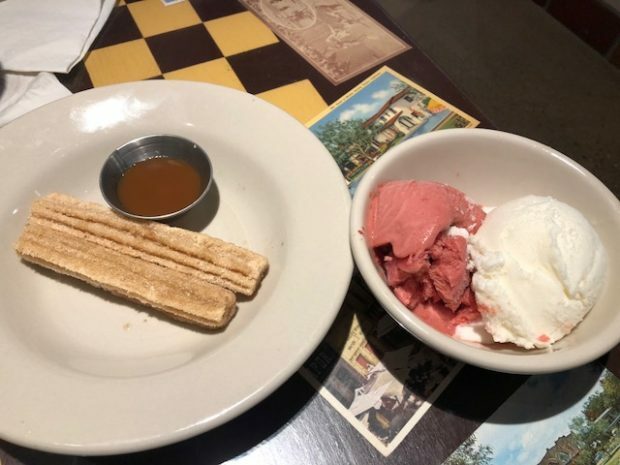 As for dessert, enjoy a cup of El Famoso’s housemade ice cream (strawberry and coconut flavors pictured below). And of course, churros! Because who doesn’t love to eat Churros at a Mexican establishment? Tequila is no stranger here at El Famoso. Choose from over a dozen Tequila brands for your cocktail (or shots!). The Captain’s List includes Avion Reserva 44, Jose Cuervo and Herradura Suprema. 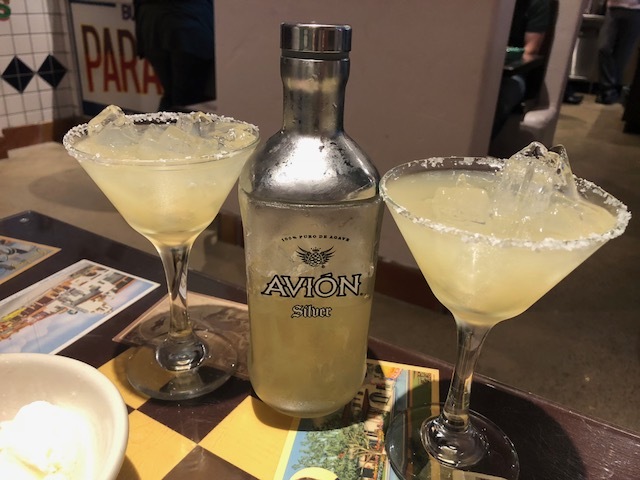 The shaker pictured above is $14 and serves about four glasses of chilled margaritas, which is great for sharing with your dining companion. 12 craft cocktails make up this part of the menu. 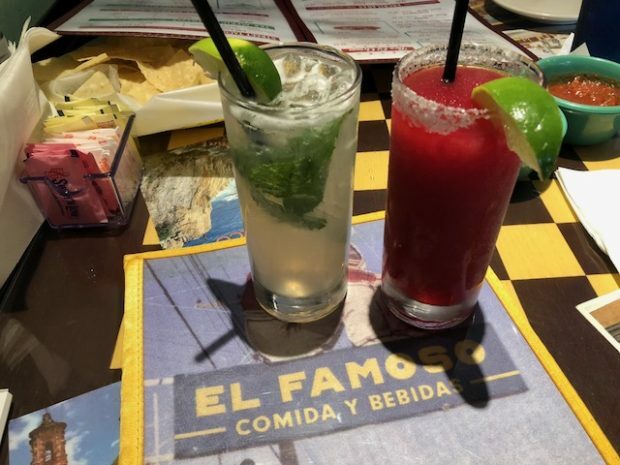 Shown above are the Mojito (made with mint simply syrup instead of soda) and the Frozen Hibiscus Margarita, a refreshingly sweet drink mixed with Herradura Silver tequila. Not feelin’ tequila? No problemo because there are a handful of $4 domestic beers, $5 imported beers and wines by the glass and bottle. El Famoso is located at 5228 N O’Connor Blvd., Irving,TX 75039 and is open daily from 11 a.. to 10 p.m.